Reality came knocking on bulls’ doors on Tuesday, the first trading session in a holiday-shortened week. Most of the major averages are down almost 2% on the day. Will the markets bounce back later this week or are we in for a moderate correction? Let’s look at Tuesday’s top stock trades to see what ones are making the big moves. Johnson & Johnson (NYSE:JNJ) is down about 2% on Tuesday, not bad considering management did not provide that inspiring of guidance after it reported earnings. Shares keep chopping between this $128 to $130 level. 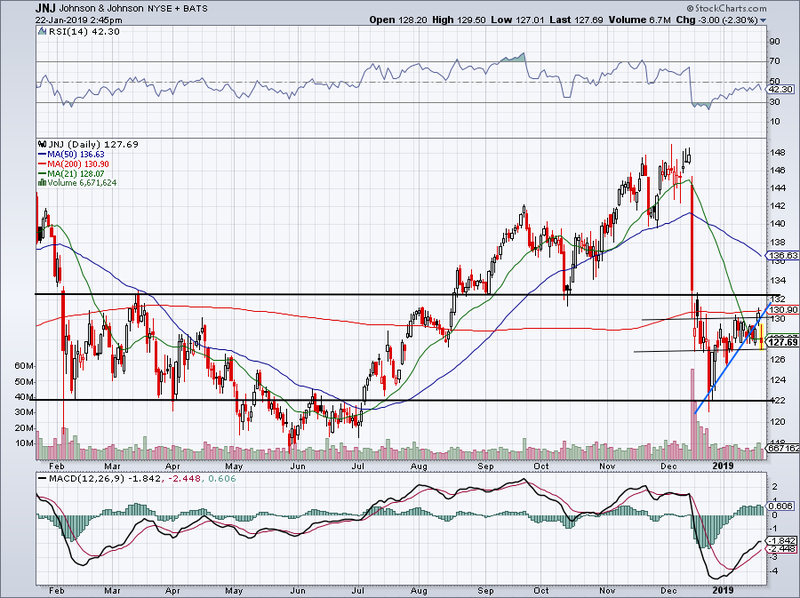 If the lower end of this zone gives way, it’s possible for JNJ stock to retest its recent lows near $122. 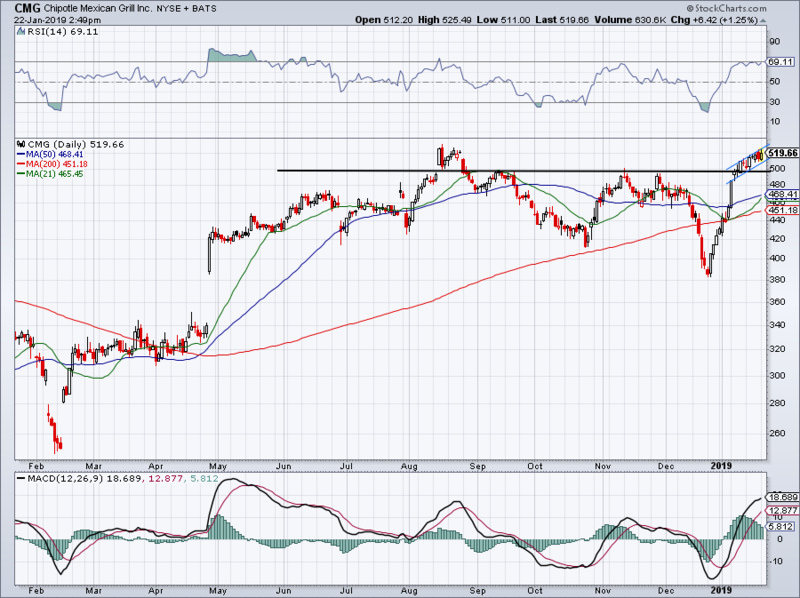 If current range support holds up, look to see if J&J can push through the 200-day moving average. Halliburton (NYSE:HAL) shares initially sold off Tuesday despite beating on earnings and revenue estimates. While the stock is still lower by about 2.5% on the day, the stock has erased most of its losses. Plus, HAL had a big gap and rally on Friday, so Tuesday’s action isn’t all that bad. I like that the name is holding up over the 50-day moving average. As a result, longs can use the 50-day as their stop-loss over the intermediate term while using Tuesday’s low as their stop-loss in the short-term. 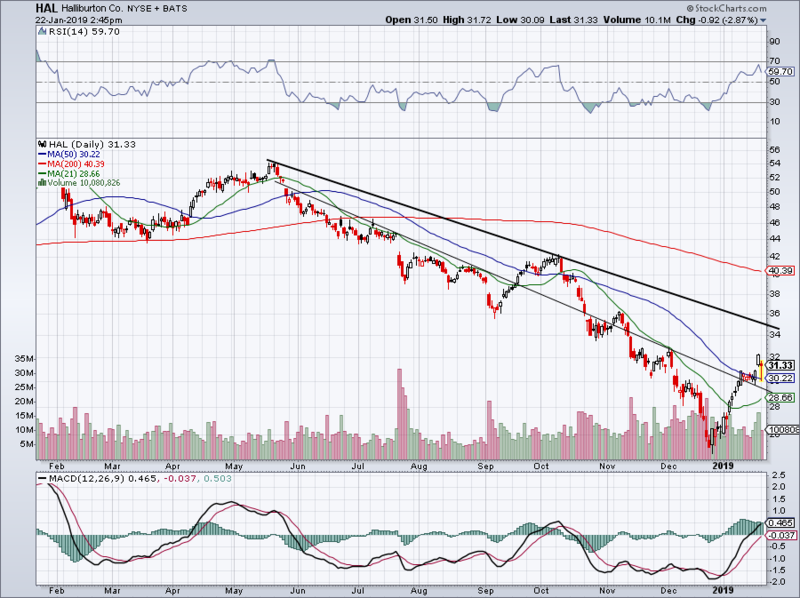 However, downtrend resistance (black line) looms a few dollars overhead. On a rally, look to see if HAL stock pauses here. Shares of eBay (NASDAQ:EBAY) are rallying more than 6% after receiving a letter from activist investor Elliott Management. It’s a big move on a down day, but EBAY is well off its session highs. Obviously it would have been positive to see eBay close over its 200-day moving average. However, much of the day’s selling could have been profit taking from breakout-buyers on Friday, as the stock closed over downtrend resistance for the first time since June. I would wait for eBay to reset before taking a new position, but if it can consolidate at or above former downtrend resistance and current uptrend support (blue line), then EBAY could be a buy in the future. Altria (NYSE:MO) caught a downgrade on Tuesday, among other things, and shares quickly plummeted to new 52-week lows. While MO may be a favorite among some investors, it’s clear the name has been out of favor. Dare we say its charts have gone up in smoke? …I’ll show myself out after the chart work. The 21-day moving average and downtrend resistance (black line) have kept buyers underwater as sellers continue to push MO lower. Not shown on this chart, but $48 was a big level on the four-year chart. Losing this mark was bad news and opens up MO to a decline down to the $41 to $42 level. All I know at this moment is that Altria is a no-touch for me. 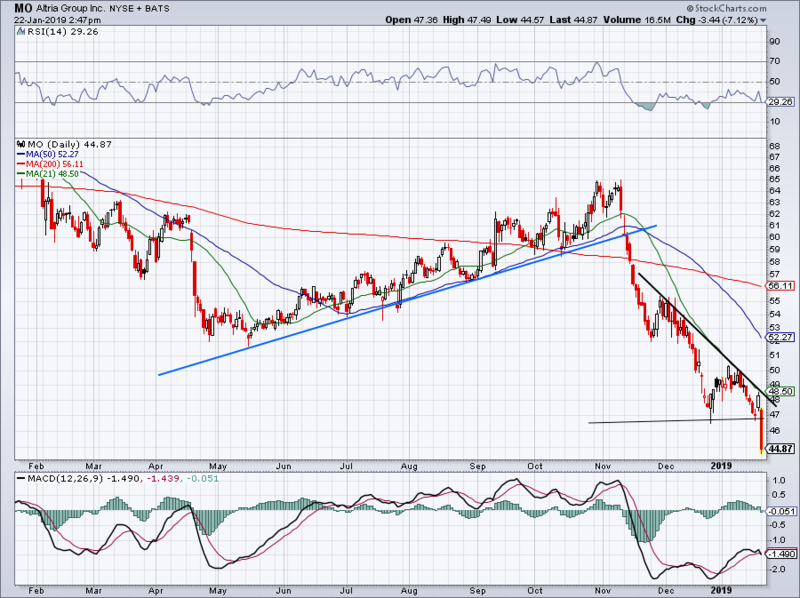 I love the way this Chipotle Mexican Grill (NYSE:CMG) has been trading. Up more than 1% on Tuesday, CMG is showing great relative strength on the day. Earlier this month, it pushed above the key $500 level and continues to grind higher. Recent buyers can certainly use this level as their stop-loss at this point. If the market comes under selling pressure — like it did in mid-December — CMG is susceptible to getting caught up in the selling too. 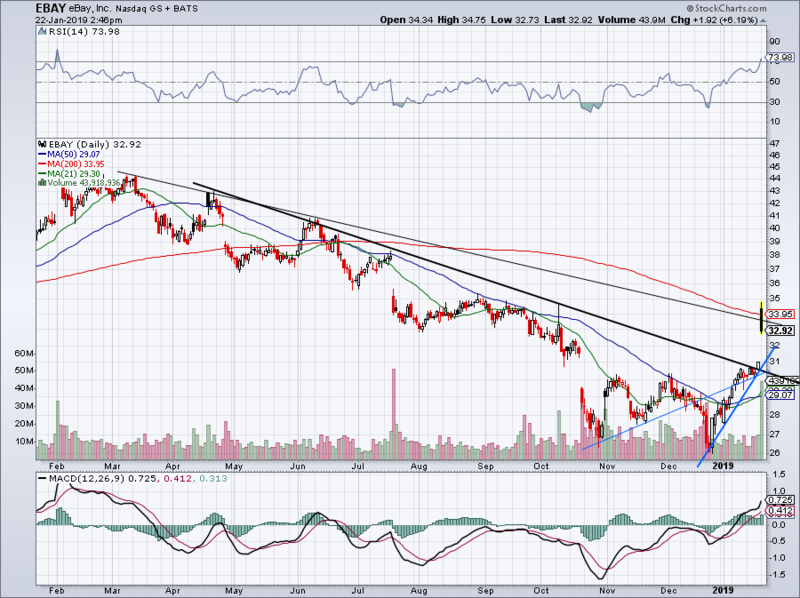 If that’s the case, Chipotle could break below $500, but reset as a great long candidate. Just look at that way it bounced back from its December lows! It’s now butting up against its highs from August, so if the markets can hold up and/or rally, CMG could be setting up to blast higher. Let’s keep an eye on this one. 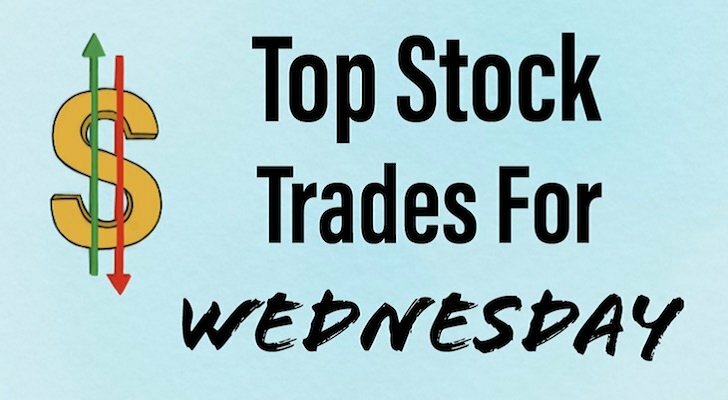 Article printed from InvestorPlace Media, https://investorplace.com/2019/01/5-top-stock-trades-for-wednesday-jnj-cmg-mo-ebay/.